Successfully Added SD Card + USB Media Player for TV to your Shopping Cart. 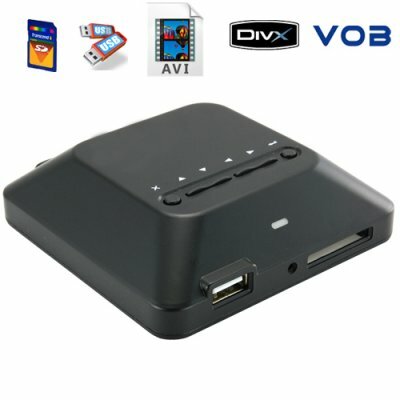 This is a wonderful little multimedia player to connect to your television. With this unit you can quickly and easily add an SD/MMC slot and USB port to your TV so you can use your memory cards or external HDD to watch digital multimedia on your living room or bedroom television. The CVJI-E50 is a user friendly digital media player with a simple menu navigation system and straight forward operation. It is designed to provide an easy user experience with efficient access to many types of video and audio file types. All you need to do is provide it with digital multimedia files via SD cards, USB flash drives, or even via an external HDD. So if you are into downloading videos off the internet but want a way to enjoy those movies and other videos on your TV, then hook this media player to a TV or monitor and enjoy digital media in the comfort of your living room / bedroom / hotel room / dorm room / or wherever you happen to be! With its small 90mm x 90mm size, this unit can be easily placed wherever you like and is even small enough for carrying along on business trips. The CVJI-E50 is available in stock today for single and bulk purchases, so get yours today, and while your at it get a few to resell on eBay, this way you cover the cost of your purchase and earn some more money to buy some more new toys! This media entertainment station is proudly brought to you from the leader in factory direct wholesale electronics, Chinavasion. Does an HDD have to be installed into this unit? No. The CVJI-E50 comes with a USB slot and a SD card slot for simple and effective viewing of your digital content from flash memory devices on your TV. With compatibility to use other media electronic devices as well via USB. Does the CVJI-E50 also come with YPbPr cables to connect to my subwoofer? Yes it does, enjoy listening to your favorite music in surround sound, You can eve connect your MP3 player to the and play files straight from your MP3 and MP4 players. This product comes with an HDMI connector. Does that mean it outputs high definition video? No, this product does not play or output high definition video files (720p, 1080p). The HDMI connector only facilitates connection to your HDTV. on 2010-10-25 08:27:04 meilleur qu'annoncé! Simple à fonctionner, efficace, suis très satisfait. quick delivery, easy to setup, and works well with a flash drive. J'en ai deux et j'en commande un troisième. Livraison rapide (une semaine max) par UPS. Discret, simple à utiliser, complet (photos, sons, films, etc.) prix très abordable. Le seul reproche que je peux lui faire est de démarrer tout seul le premier fichier qui se trouve sur la carte SDHC ou dans la clé USB. Il faut donc stopper la lecture et chercher le film ou la série (ou les photos) qu'on veut voir ou cliquer sur la touche bleue "File" de la télécommande dès la mise sous tension. Pour faciliter les choses, il affiche dans une petit écran le début du fichier sélectionné. Ah, c'est aussi un peu complexe à régler la première fois (setup), mais j'y suis arrivé, tant ici qu'en France. Commandez le câble HDMI (excellente qualité) en même temps. good little useful product for the holidays and even at home. Lo pedí un Domingo y el jueves llegaba a Bilbao(España). Un disco de 80Gb tarda en leerlo pero un pendrive de 8Gb, lo lee fácilmente. Su instalación es muy sencilla. No necesito más para reproducir en la TV.